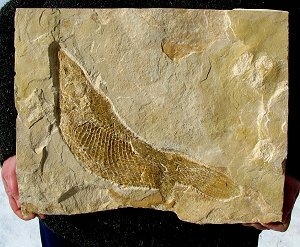 This is a special fossil fish. It is a large Unidentified Fossil Gar from the Jurassic of Utah. A complete Fossil Gar is one of the most sought-after fossil fish in the world! Modern day Gars are fierce predators at the top of the food chain in lakes and rivers. Gars are known for their large, rhomboid scales, which are fully intact and beautifully preserved on this specimen. This fish is from the Jurassic, MUCH older than the fish found in the Green River Formation - only TWO complete specimens have been found at this location! The fish has great detail preserved on the head, body, fins, and tail. This specimen is 15 inches long and has had NO REPAIR OR RESTORATION. The fossil is well displayed on the large, unbroken block of dense limestone. This is a very collectible example of a RARE fossil fish from the Time of the Dinosaurs.